Several of my books have been published traditionally, and I’ve had a fair amount of success that way. But now I’m focusing on managing the whole process myself, from writing through publication, for three reasons: speed, control, and return. A self-published author sees his book for sale within days of completion. If he goes through a traditional publisher, he likely would have to wait 12 to 18 months. A self-published author has control of his book’s words, cover, interior layout, and marketing. Those may be partly or entirely out of his control if he uses a traditional publisher. 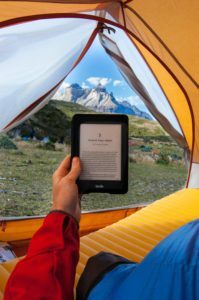 A self-published author earns more per copy sold—whether ebook or paperback—than he does when his book is published traditionally. The good thing about publishing traditionally—that is, through an established publishing house—is that there isn’t much for a author to do after he turns in his manuscript. Usually the cover design, interior layout, and (some of) the marketing are done by the publisher. The biggest drawback is that it takes up to a year-and-a-half before that turned-in manuscript becomes a physical book. If the book is on a timely subject, it may be timely no longer. As convenient as it may be to have a publishing house handle the cover, interior, and marketing, often enough the first isn’t done to an author’s satisfaction. The author may see the cover only shortly before the book is launched. He may have had no input on cover design, and the design chosen by the publisher may not portray the book accurately, or it simply may not be an attractive design. As for marketing, usually the author is involved as much (or more) than anyone at the publishing house; it’s not the case that all the marketing is taken off his back. And the publishing house’s commitment may be short-lived. It may engage in a flurry of marketing activity at the book’s launch, followed by almost nothing later. And then there’s the money. Royalty provisions in book contracts can be convoluted. A new author might think that a 12 percent royalty means he’ll earn $1.80 on each sale of a book that has a list price of $15.00, but that’s not how it works out. He might see between half and two-thirds that much because contracts take into account returns, discounted books, bulk-sale pricing, and other things. If the author sells a digital copy of the same book at one-third the price ($5.00), he actually will make twice the royalty. If he has a platform—that is, a pre-existing audience—he might find that he can sell as many copies at the lower price as the publishing house could have sold at the higher price. If so, the author ends up with twice as much in his pocket. None of that is guaranteed, of course, but it’s not guaranteed that a traditional publisher will succeed in selling an author’s books. As I said, I’ve had success with some traditionally-published books, but I also have had books that didn’t go past their first printing. Going with a traditional publisher is no sure thing. Neither is self-publishing. There is a risk either way.